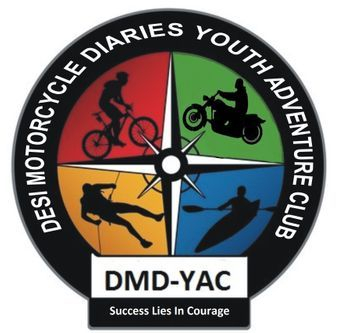 Desi Motorcycle Diaries – Youth Adventure Club (DMDYAC) is a non-profit organisation that lives up to its motto ‘Success lies in courage’ through the various activities it has held to benefit society. It was an idea that germinated in the mind of Suprajit Raikar, a qualified software engineer with strong leanings towards social work. His empathetic and unassuming personality is apparent when you meet him. The organisation works as an amalgamation of an adventure club and social work. It came into existence in June 2014 in Benaulim, Goa, and its founders are Suprajit Raikar, Deepika Raikar, Siddhesh Kenkre, Srikrishna Mauzo, Pritesh Raiker, and Harish Shirodkar. Recently (May 2017), DMDYAC completed phase two of its 100 Solar Lamps project that involved distributing 85 solar lamps to the villages of Virdi, Vargani, Tudov, Verlem, Salgini, and Pathwadda. The main reason behind this is the intermittent supply of electricity that plagues most towns and villages. Besides, in this day and age, we still have villages that have no electricity at all. These lamps, which are charged using solar energy, can easily replace kerosene or oil lamps to provide illumination in the night. This is environmentally friendly and cost effective, as it saves the villagers the Rs 150 they spend every month on purchasing kerosene or oil. These are people from far-flung areas, who rely on the forest and the nature around them to survive. Currency is a commodity which they can ill afford to spend thoughtlessly. A saving of Rs 150 can go a long way towards financing their trade and children’s education. The Western Ghats have particularly been targeted for this project, with solar lamps to be donated to children from disadvantaged families and studying in government run schools. 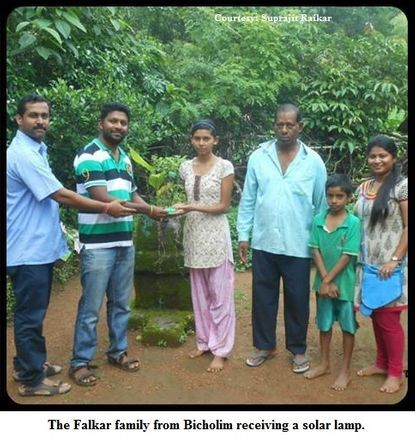 The Falkar family from Bicholim, who were in the news in 2015 because of they had lived for fifty years without water and electricity supply to their house, were beneficiaries of this project in its earlier phase. The solar lamps were purchased from Waaree Energies LTD.
Another project taken up by DMDYAC is to do with seed bombs. Since the month of May (2017), after combining 5 parts of clay, 1 part compost, 1 part indigenous seed (eg jamun) and water, and then letting it sun-dry, the seed bombs have been produced to be dispersed in different areas, especially the Western Ghats (Sahyadri region). The project will continue up to 20th September 2017 and has had Nirmal Vishwa, Cycling Goa, Siemens, Verna, JCI, Mormugao Port Town and Jagrut Nagrik Manch, Vasco, participate in the project so far. The target is planting 1000 seed bombs. DMDYAC, in collaboration with Raika, has its Bees for Sustainable Development Project as well, to provide tribal people in the Western Ghats with bee boxes to produce honey, which will substantially increase the income of these people. 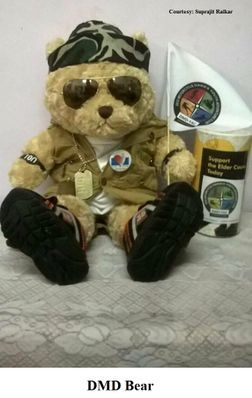 The travelling DMD Bear is an entertaining way of raising funds that is employed by DMDYAC. The bear is passed from donor to donor after taking a selfie with each of them. The idea was derived from the American ‘Charlie Bear’. At the moment, the adorable teddy, donning fierce biker gear, is with his feet up at home. He has helped collect funds for HelpAge India, an organisation that cares for elderly persons who have been abandoned or do not have the means to support themselves. DMDYAC has proved time and again that courage is the route to success, and that perseverance and hope can make all the difference when faced with challenges. The club has done and is doing much to make a positive change in society which must be lauded, and we look forward to the fruitful outcome of all its endeavours.